The Big Block grey precast wall has a larger block pattern than the Small Brick concrete walling pattern. The wide block smooth finish texture contributes to the naturally authentic look of this beautiful precast concrete fence. 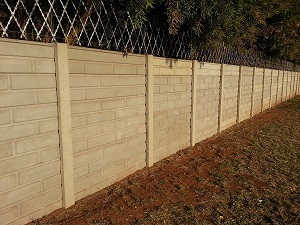 This concrete fence is ideal for most aesthetic requirements suited for projects and architectural styles frrm Santon to Centurion that incorporate large, bold rectangular shapes. We can install this wall with or without a bar top. This type of concrete walling can be painted very affectively. The blocks one colour and the valleys a other color. At a precast walls price of a plain concrete wall. This precast fencing product is manufactured using our custom moulds to create a superbly finished precast concrete wall for your project. As with all of our designer concrete fences, the textural definition is naturally enhanced by the changing light of the sun. The deep texture contributes to noise reduction along busy thoroughfares when installed as a sound barrier up to 2.45 meters high or screen wall and is a welcomed visual enhancement to property owners adjacent to the road.